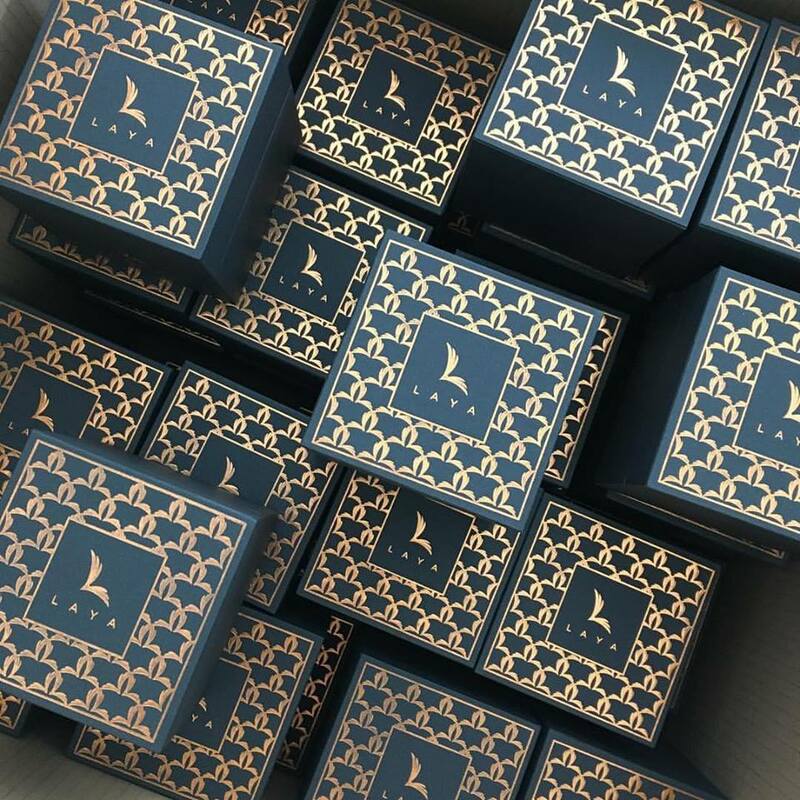 Remember, if the logo is the product, the presentation is the packaging. Clients are not creative directors. So stop treating them as such. Manage and control revisions for the logo process. You are selling the client on your logo. Solid discovery phase is primary. You want to make sure that you are speaking with a brand strategist to develop a solid story for your business. Creating a narrative that will build the identity of the brand is a key component before every starting the visual identity process. Make sure you have concrete steps when creating your discovery process. Make sure that the client is lead through a series of steps. The way to sell your professionalism is to showcase that you are a serious business with more than knowledge, but a script to help create a strong and unified selling proposition. 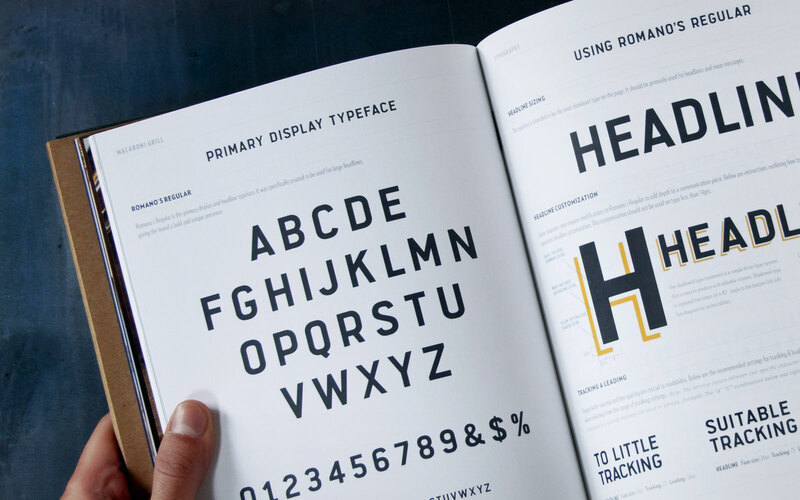 Basically this is your basic style guide that you or a designer would put together for you. 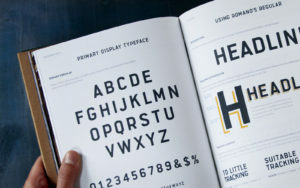 This walks you through your brand position through keywords to get to your logotype, color palette, typography, etc. Start at the beginning for logo presentation. “Our goal is to build a new visual identity that…” Insert the pain point that you discussed with the client or the objective that you were hoping to attain with your rebrand. Reliving the pain point points the client back into the buying mentality. A powerful tool for approvals. Also making sure that the client can not go against himself in the meeting of the words and opinions they had when going through the discovery process. Put them back in the same place they were when they were in the discovery process. Keep them on track before jumping into the logo designs. Recap the steps you have taken together. “Before we dig in to the work, let’s take a step back and review…” Show them a slide with all the important words and phrases associated with the rebrand. Even showing the process of how you both got to the the same final phrase that describes their new identity. Even show the mood board that you have created in the discovery session. Go through the stylescape as well. Explain your thoughts about each design. 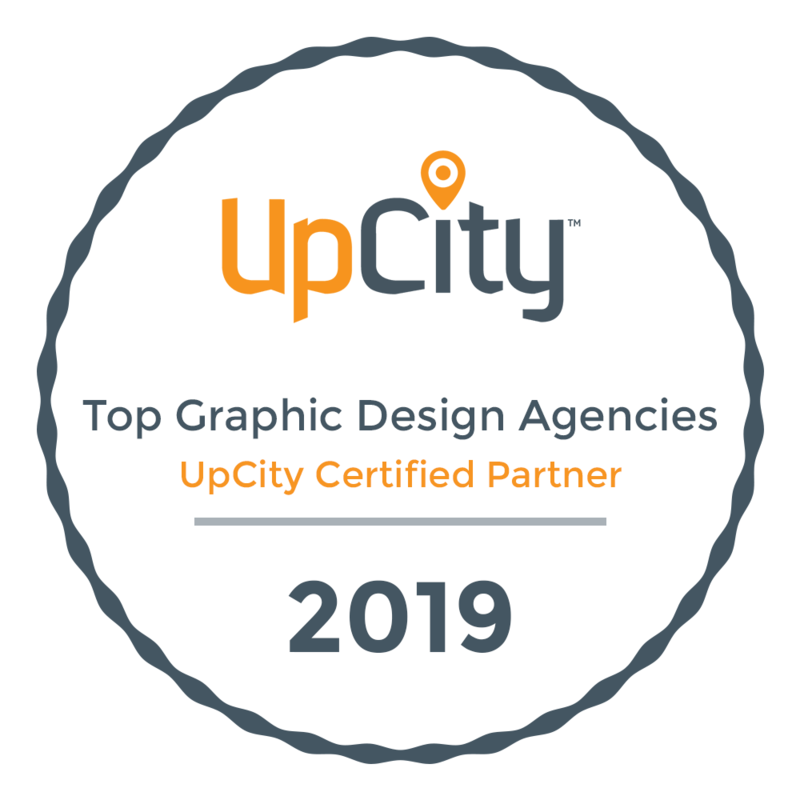 If your logo has a story and data to back up your claims your client is going to see your work as professional and legit. Know the logo is good when you go in. If there’s one logo you dislike and don’t feel it fits the narrative than you should scrap it and go back to design another version. Nervous energy when presenting can come across easily in a meeting. Show the relationship between your design and the inspiration you pulled from the mood board or some of your research. 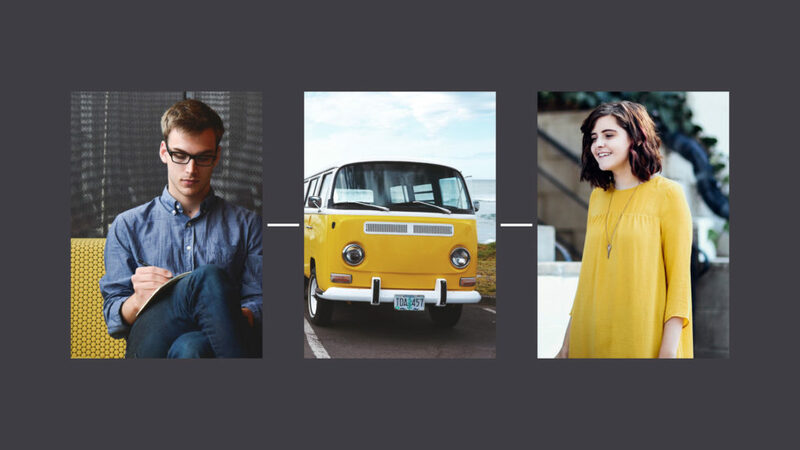 Show the arch of transformation to give a visual story to the client. This will create an increasing advantage in trying to sell a logo design. First slide should have logo on white background with a lot of negative space. Second slide is split screen with white logo on black background and black logo on white background. No color should be presented on this slide. Third slide is collection of standard mockups. Use elements from discovery to keep consistent with brand. Imagery is consistent. Fourth Slide is a collection of small format mockups. Pencils, hats small corporate icons on tshirts, or social media icons. Fifth Slide is large format mockups. Billboards, side of building, and within the store on the wall or something. Sixth Slide is the logo again on a white background to finish the slides and showcase the understanding of the final logo and keep it simple on their mind. Repeat these slides for the other two logos. Compare the three logos on a slide at the end. Don’t show this slide unless necessary. I have this to make sure if the client asks for it I have it, but I don’t like to show apples to apples if possible. I gave a speech yesterday at Launch SA about designing your brand. I wanted to give clients the understand of what they should be receiving with completing a style guideline. There are too many designers creating logos or graphics without thinking about the entire package. Visual Identity is the key component in developing a brand that people can trust and belief in over the life of the company. I want to start off by separating a few key definitions that people get jumbled up on before stepping into the step by step piece of a visual identity. Marketing: Marketing is the activity, set of institutions, and processes for creating, communicating, delivering, and exchanging offerings that have value for customers, clients, partners, and society at large. Public Relations: professionals help a business or individual cultivate a positive reputation with the public through various unpaid or earned communications, including traditional media, social media, and in-person engagements. Advertising: the act or practice of calling public attention to one’s product, service, need, etc., especially by paid announcements in newspapers and magazines, over radio or television, on billboards, etc. 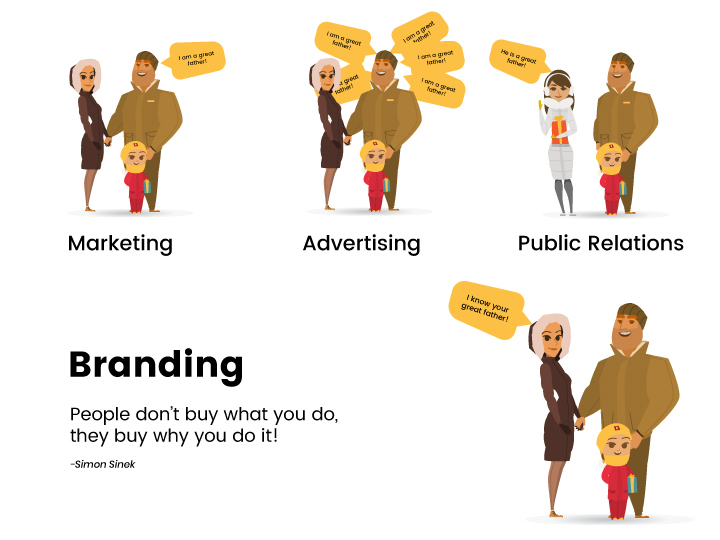 Branding: A good definition of branding is through a definition by Marty Neumeuer in the “Brand Gap” is a person’s gut feeling about a product, service or company. You can’t control the process but you can influence. 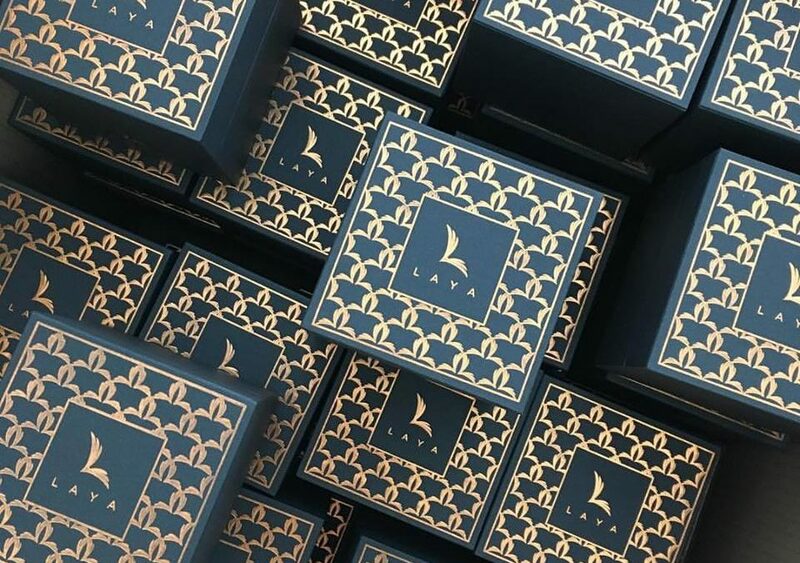 Visual identity is the visible elements of a brand such as color form and shape which creates the symbolic meanings that can not be imparted through words alone. Make sure when speaking with a design firm or a designer that they are asking for your mission statement, vision statement, brand positioning and doing market research to identity what your competitors are doing currently in the marketplace. DO NOT design start a design endeavor with a firm or designer that does not ask you for those answers. When working on the visual identity of a company they need to know who they are designing for and why they are designing this should make a massive difference in the design itself. Logo is a mark, symbol or icon that identifies an organization. A logo is not a brand, but instead a calling card for the business. A logo is a symbol to represent the culture and mission not the product or service being presented at the time. Always remember that a logo is not your brand nor is it a straight representation of your product it should represent your mission and culture. The Nike logo was created based on the greek goddess of victory, Nike. The shape of the Nike logo represents an arch of movement. The Nike Swoosh logo is shaped as the wing of the Greek goddess of Victory. 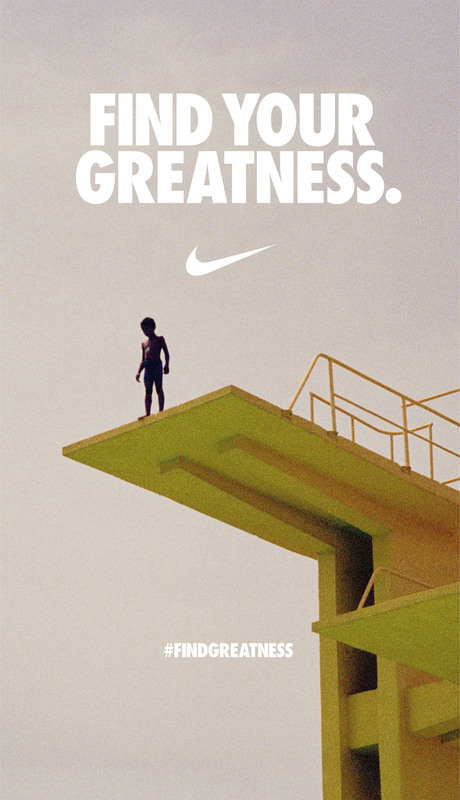 Nike could have had a shoe for its logo, but instead they saw the vision of the brand to represent victory, ambition, and the ultimate strive for success. A mood board says what you can not say with words. As a client and a designer you are trying to bridge the gap between word definitions. Modern to a graphic designer versus modern to a client will be completely different and you need to find a way to understand each other visually. 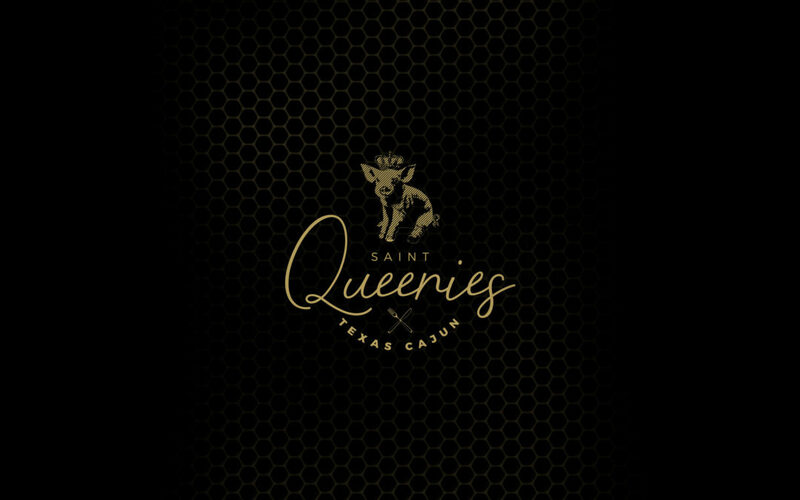 Matching imagery, typography, demographic representations, textures and gain an understanding of the essence of the brand. A mood board should start with a wide birth collecting as much content as you can. Capturing hundreds of images to aid visual elements that mean something to your business. Never pigeonhole yourself. Once complete start to cut down the clutter to one page making sure each image, font and texture tell a story that creates a cohesive style to formulate your visual identity. This process will help to cut down on back and forth development between the client and the designer. Understand each other visually before the process begins to have a clear picture of how the identity should be represented. Bridging the gap is the most crucial part of the process. What makes a great logo? Remember K.I.S.S. keep it simple stupid! Simple logos are easily recognized and memorable. Driving at 70 MPH past a billboard, or standing out on a crowded shelf your mark needs to be eye-catching and simple to grab the audience. Simple to doodle is a great way to think of how your logo should be structured. Nike has the simple check icon, Apple has the representation of an apple with the bite from Eve out of it and Adidas has the three stripes to represent climbing the mountain to excellence. All of these logos are simple enough to sketch whether good or bad very quickly by majority of people. They all call the attention to their mission instead of their product. If you created a logo solely based on what you sold than Nike would have a shoe, Apple a computer and Google a piece of clipart of someone at their computer. Capture the mission and ideals and stray away from the product. Logo is an icon not a straight interpretation of what you do. Nike’s logo is not a shoe, Apple’s logo is not a computer, American Airlines is not a plane. You can have a tie to what you do but it should be done in a way that expresses your mission more than your product. If you box yourself in with a logo than you can never expand without doing a new logo each time which will decrease your recognition. When viewing your logo for the first time always view it in black and white. 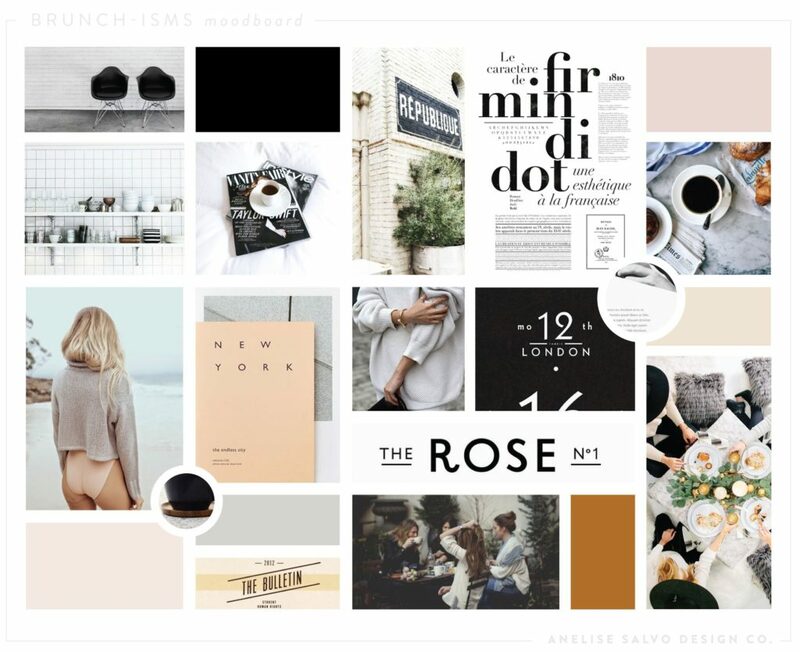 Make sure the construction of the logo fits your vision, mission and mood board before moving into the color palette. You do not want to have to use color to fix any problems with your logo. If you think that your logo does not look appropriate in black and white do not hope that color will fix that. Get it right from the beginning. Most of the time your logo will only be represented in one color because of cost issues or printing so don’t be fooled by shades, textures and excessive colors. See it in black and white first to make sure it works perfectly. 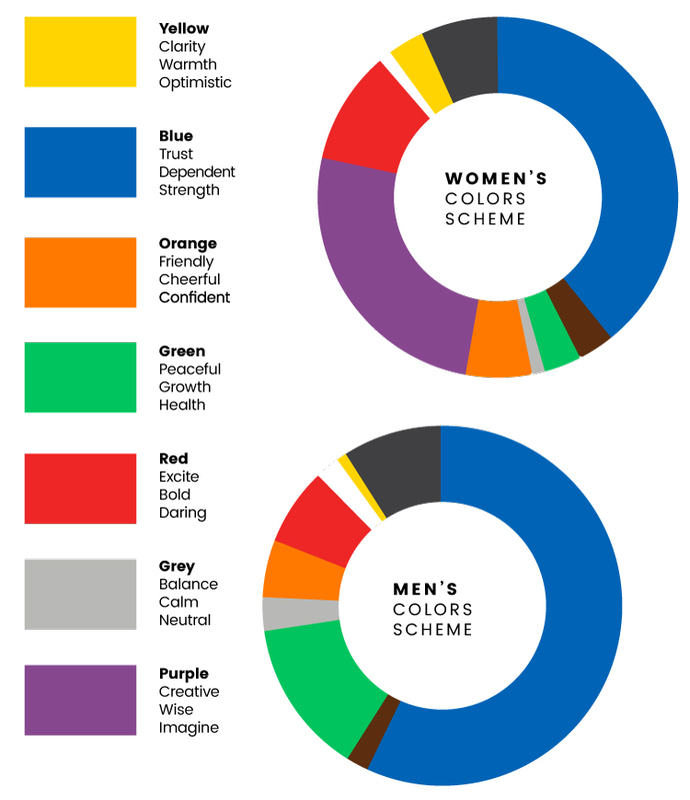 Color palette for your brand needs to be viewed through analytics as shown above with the breakdown of men’s and women’s favorite color schemes. As you can see blue is the overwhelming favorite for both men and women which is more than likely the reason why blue stands for trust and loyalty. As for the other colors meanings. I will never ask a client for his favorite color and if a designer asks that question than get rid of them because they should not be designing a logo for you as the business owner, but instead for the specific demographic they are selling to. 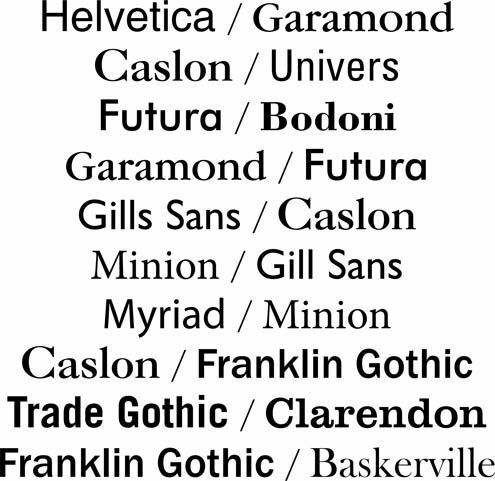 Never use these fonts. Period. 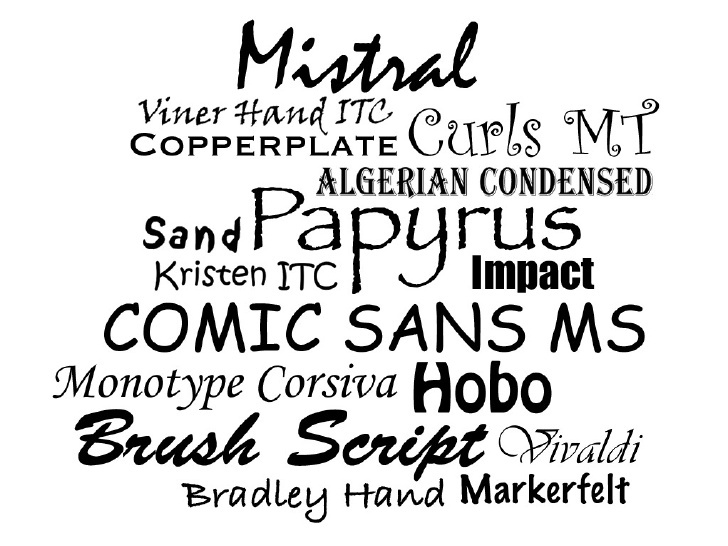 When picking a font make sure it has these items for success. Check the kerning/leading as many fonts created on sites such as Font Squirrel or 1000 Fonts have not been checked and can cause many issues down the road. Imagery for a brand needs to have a common theme whether that is a pop of color or a common thread within the photos (Cities, Farms, Food). If you have the ability to bring a photographer to take photos for your brand is highly recommended especially for products that need to look phenomenal in presentation i.e. food brands, clothing brands, etc. On the other hand if you have to go the stock photo route take the time to look through photos to match up with the same artist or find images that have common threads to match your brand. Remember that if a customer comes to your website through a search they may never see your homepage, so never put an image to fill space because that image on page 4 might be the only image a customer sees and it could turn them away. Be methodical in your search or chose of a photographer. Quick Tip: Ask the photographer to provide you with an action record in photoshop as to be able to add his photoshop edits to all your photos moving forward. It may require more money up front, but it will be a game-changer in the end. Texture adds depth to your brand through a sense of touch. Always try to invoke all the senses when creating a visual identity. Create an immersive relationship with your clients especially when dealing with a brand that will have clients eating, drinking or wearing your product. Last but not least is the style guide. Make sure you are left with a style guide at the end of this process. Something that can be stored and accessed efficiently at any time to save you and your team money. Everything from your logo, imagery, typography, color palette and textures should be provided within this PDF. All the files should also be accompanied with this in all file types. As the owner of the brand you should be given full control of the designs with the ability to change or alter anything in the future. Welcome to GlassBeard Tutorials. 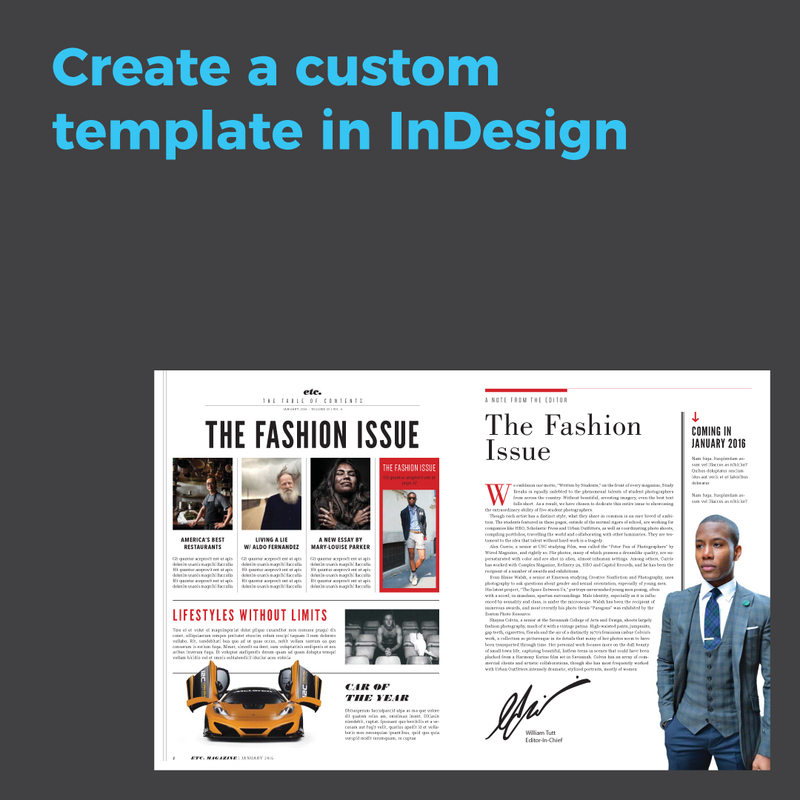 Today, we will be creating a custom template InDesign CC 2017. If you have an older version of InDesign, do not worry. CS6, CS5, or Creative Cloud, setting up a document is about the same. So, just follow the steps that we have today, and you should be fine. • Go to ‘new’, we’re going to slide over and open up the document. • Select ‘preview’ here at the bottom left, just so we can see exactly what’s happening behind us. We can talk about web and mobile a little bit later, but for today’s purposes, we’ll be doing print in Adobe InDesign. So, select ‘print’ here. We’re going to be creating a postcard today. So, our pages will be one page. We’re just going to do a one-sided postcard. So, right here we’re just going to select one page, but when you’re talking to your printing professional, make sure to ask how many pages you’re going to need, so you can make this change right here. And just as a side note, if you are going to be doing a magazine, and you’re thinking about how many pages you’re going to put together for that, make sure you do it in increments of four. That’s how the magazine will be put together, so you can do a four-page magazine, an eight-page magazine, a thirty-two-page magazine, as you can see, just as long as they’re increments of four. For our purposes, facing pages won’t make a big difference, but when you’re creating a magazine or a brochure it will in Adobe InDesign. So, just as a point of habit, always select ‘facing pages’ here. Your start page, ninety-nine percent of the time your start page will be one. So, your first page will be page one. There are some times when that will not happen, but for our purposes, and for I would say ninety-nine percent of the times that you need, it will be page one. • Go down to ‘custom’. Now, as you can see, we’ll get another little pop-up box here. • Give it a little title here, and now we’re going to go into here, and we’re going to go width is four inches, and we’re going to go down here with height as six inches. Once we have those two numbers in here, we can go down to ‘add’, and you can see down here it populates Postcard 4×6, so we’ll select that and say ‘okay’. And as you can see it auto populates here in Adobe InDesign, so we have our page size is a postcard four inches by six inches, and you can double check right here that our width is four inches wide, and our height six inches, okay? Now, if I can move this pop up screen a little bit over, ‘columns’ does not have any effect on the actual printing process, but it does help you organize your text and your images during the printing process. So, you can come in here, and you can change it so you can see that. I have seven columns, I have eight columns, I can have as little as one column. So, looks like I have no columns in here. For this, we’ll do three columns. It’s a little bit smaller of a document size, so we’ll keep it pretty small. So, you can see these big areas right here, that’s your columns. Now, your gutter, this inside the columns, we’ll put this down to an eighth of an inch. So, just so when you have text in here, if you’re separating it out by your text, you can have it in here, and you can have a little bit of a separation just to keep your columns nice and clean. But like I said, this has no effect on the printing process. You can have as many or as little, as big of a gutter or as small of a gutter as you want. This is just for your own purposes when you’re designing and creating a postcard, or a magazine, or a brochure. 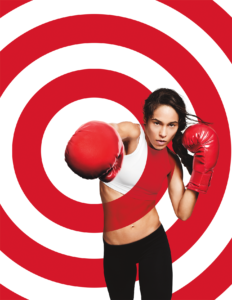 What does come into play is your margins and your bleed in Adobe InDesign. So, if you’ve been talking to your printing professional, more than likely they’ve already talked to you about that your bleed has to be a quarter of an inch, and your margin has to be a quarter of an inch. So, let me go through and kind of explain this to you. This black line that sits in the middle of both lines is your postcard. So, that’s your four inches wide by six inches tall, okay? This will be your final document size. What happens is that everything on here will be printed, so all the way out to this red line will be printed on a flat sheet of paper, with multiples of this postcard, depending on how many you’re printing. When the card is about to be finalized, it will be cut down to this black line. So, all this space right here, all this out to this red line will be cut. Now, the margin is the purple line that sits in here, and your colors may be a little different, but just know that this inside line right here will be your margin, and your margin needs to be a quarter of an inch inside of this black line. And we see that here on our pop-up screen, right? A quarter of an inch inside, outside, bottom, top. And this gives the printer a little bit of wiggle room. So, the printer, when he goes to cut, if he cuts a little bit narrow, he doesn’t cut off any of your text, or any of your important information, and if he cuts a little bit wide, and your bleed is set at your standard, which should be a quarter of an inch here, then if you have an image stretched to the outside and it cuts it, that way you don’t have any little white space if it cuts a little narrow, or it cuts a little wide. So, this is for our purposes, and you need to have these set in here in Adobe InDesign. So, make sure to have a quarter of an inch in on the margin, and then a quarter of an inch on the bleed, okay? Now, the only thing that I can change here is that your margin can be bigger. So, as long as my margin is at least at a minimum of a quarter of an inch here, I’ll be fine. But for design purposes, if I want to bring this in to let’s say half an inch, I can do that, and so all my text will sit in here and give a little bit more breathing room on the outside, but that’s a design choice. All we’re asking for when we’re as far as the print, is that you at least have a quarter of an inch margin here, okay? Now, since we have everything saved for a postcard at four inches by six inches, we’re going to create a preset, so that way when you come back to here, you don’t have to fill out all this information or watch this video again. All you need to do is, you can go down, and you can click your document preset. So. let’s go here to this saved document preset, which is on the right-hand side of your document preset. We’re going to open that up, and we’re going to name this ‘Postcard’, and we’re going to give the dimensions just to give ourselves a little bit of knowledge, so ‘Postcard 4×6’, and click ‘okay’. And then we click ‘okay’ here, you have your template all set up. Now, if I was going to go and I was going to open up a new document, and I wanted to do the same thing, I wanted to do another postcard, four by six for GlassBeard Media, and I didn’t want to write all this information out, don’t worry, because we’ve saved this. So, go to ‘document preset’, right up here, the drop down menu, and you can go right here to our saved document preset, which is ‘Postcard 4×6’. Now, watch as everything changes. See? Everything has changed. Now, we have our width as four by six, which is perfect, we have what we had saved last time, which is our columns at three, we have our margins, and our bleed, and our specified distance which is a quarter of an inch. We’re all set up. So, if you ever need to come back, you can just go here, and you can pick out your already predefined document preset. Remember, everything you need is right there. So, just finding out what your new sizes are, what your page sizes are, everything like that will come from your printing professional. So, if you need anything else, please write in the comments and we’ll try to relay any information that we can, but you’re all set up to go, and everything looks great. Thank you, guys, for staying with us for this GlassBeard tutorial, and we’ll be back soon with more. Thank you. 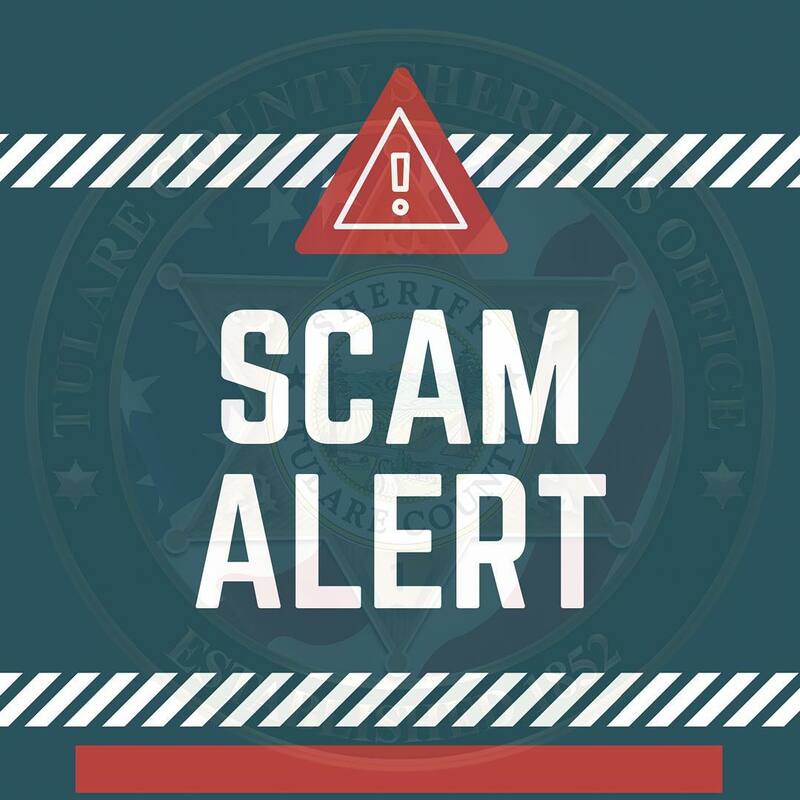 Scammers Targeting Graphic Companies so BEWARE! All graphic design companies beware of scammers attacking your business. These scammers are trying to get you sucked into doing a job for them and then turning around and getting you to pay thousands of dollars. I was recently attacked by a scammer that was looking for website design work. I understood what he was trying to do very quickly, but I wanted to entertain the scam in order to give my fellow colleagues some well need information to keep you safe. The first thing they will do is send an email that seems well enough trying to get you to respond back to them about getting a quote for a website design proposal. How are you doing an hope your weekend was awesome,I wanna know if you can handle website design for a new company and also if you do you accept credit cards? From hereI was in meetings all day and did not get back to my house until later in the day when I received a phone call from a (347) area code. This seemed odd since most of my work comes from San Antonio as a (210) area code. It was Josh from the email which made it seem even more legit since I was speaking with an actual human being. The phone call was short and it was extremely hard to understand what he was saying. He wanted me to get the proposal over to him ASAP and if we could just text instead of calling which to I agreed. I sent the proposal over to Josh in the morning outlining the details of the website, cost and timeline for him and his company members to look over. I got a notice back within 10 minutes saying the price was good. If someone agrees to a contract this fast with no push back on price you either charged way too less or the client is scamming you. He also sent stipulations on how to make the payments which is when the scam showed through. Thanks for your response, I am okay with the estimate everything sound good and i’m ready to make payment now with my credit card, I understand the content for this site would be needed so work can start asap but i will need a Little favor from you and the favor is that I will send you my credit card to charge for the sum of $7,100.00 plus 3% Cc company charges, You will deduct $3,000.00 for the design of the website plus extra $100.00 as a tip for handling perfect work for me and you will send the remaining $4,000.00 to the project consultant that has the text content and the logo for my website so once he receive the $4,000.00 he would send the text content and logo needed for my website to you so work can start asap,Sending of funds would be after money clears into your account, So you ready for my card # now ? or will you send me an invoice to make the payment ? what type of card merchant do you to process payment ?Kindly get back to me so we can proceed with payment asap. Once this message was sent it was obvious to me that it was a SCAM, but I wanted to see for everyone in this same predicament that may not have seen this as a scam what to do. Always use a third party payment system! I checked out the reviews on this website which were horrible and full of scam reviews. Always check on reviews before using a system you yet to use on a normal basis. Always be aware of anyone trying to push you into something quickly and harassing you to make a quick decision. Most scammers are looking for easy targets and unfortunately that is typically designers that are in need of money. Please be careful and really look into anyone you are signing a contract with today or tomorrow. There are times when designers come up to me and ask that they only have boring clients. They say I want to have big brands that are doing amazing things, but I am stuck with small clients that won’t do anything. The difference between a designer that is able to get their clients to do incredible things and those that can’t is effort. As a designer in this day and age you have to stay motivated to go the extra mile and show your clients how your ideas can improve their business. When your clients are putting the stop signs up for your ideas that you believe will take them to the next level you need stay motivated to show them not tell them. When you are a smaller design company many clients will not have a lot of confidence because of your lack of work, so you will need to go the extra mile to convince them. Create a proposal that explains the benefits and a few examples of how the design will work for them. Going the extra mile with a few of your early clients will start to get your name out there with other bigger agencies and clients. The number one thing to remember is that when you are proposing ideas and concepts to a client the first thing a client will do is look at your success. Your success will make them motivated to accept your proposal, past clients and your website. If you are proposing SEO development, but you are on the third page of Google then your client will not be able to trust your delivery. The good and bad thing about a graphic design business is that you are transparent with your work. Clients can see what to expect without having to spend weeks waiting for the first installment, so creating effective work on your website will go a long way. No matter the size of the company you are working for always be professional and on-time with everything. When I go to see a client I always wear a suit and show up 10-15min before my appointment. When I arrive I have my computer with ideas already thought out of how I can improve their business and a pen/paper to be ready for notes. Never underestimate a business for any reason. My best advice is to always stay motivated when working with clients. As designers we can get high and mighty quickly if we notice that the font looks ugly making us believe the company is terrible. Always listen first to your clients and really understand their business first before trying to make every company look like Nike or Apple. Listen to their needs, understand their clientele, and their motivation. Limit your time on Dribble/Pinterest and take some time to reflect on your client. We can get to focused on making each client look sleek and sophisticated when they are a small business in a rural location. Stay focused on the brand and success will come! Composition is All About Grids! Welcome to a simple introduction to layout and compostion as it pertains to graphic design, visual identity and UX design functionality. Layout and Composition in graphic design is crucial and will give the simple effect of structure and professionalism. You can do everything wrong, but if your grid is perfect you can still have a decent design project by the end. Read through these steps to help you in your design work for your clients in the future. Remember when designing that your end goal is for your work to be readable and quickly viewed for the user. Keeping like things placed close together visually gives them order when viewed on a page. Giving more space two different groups will allow the viewer to understand the difference between them without having to work at it. however it is referring to the negative space on a page. Giving your work space to breath away from the margins on a page will allow the viewer to pause at each section. When you write an article you use periods to make the reader pause and start a new subject. In the same vein you want your viewer to have visual breaks when looking at your design. Make sure to always look at the negative space before finishing a project. When aligning on a website design or printed piece of work make sure to always start with a grid. In website design they have many grid systems such as foundation or bootstrap. These both use 12 column grids to make sure that you can align all your elements properly and do not have to deal with images hanging past a paragraph or header. There are many reasons for a grid, but the main purpose is to keep everything properly grouped. When writing a paper you always use a lined journal becuase trying to read notes from a blank page which you have written on in a thousand different angles is difficult to read. Remember as a designer your number one goal is for the end user to easy attain the information at a quick and efficient pace. We have talked about this subject in a few posts, but it never wrong to revisit something as important as this. Creating contrast can happen in various ways such as having larger images, increasing the font weight, or contrasting style of text. Hierarchy is another way to add contrast by creating a visual effect that tells the viewer what to read first to last. Make sure you create a path for how the reader will read the design. I always have someone with fresh eyes view my work for under 30 seconds. If the viewer could not pick out the key items in that timeframe then I need to readjust. When designing a project you want to create a mini guideline of fonts for headers, paragraphs, color scheme and a few elements that will be used throughout the project. If you are creating a larger project this will need to be a bit more in depth. You always want to be using the same elements throughout any design to give consistency and give your design a nice flow from one section to the next. of the design process. If you can navigate a design simply and easily it will trump flashy concepts everyday.